Teachers all over are beginning to freak out about now. Winter is coming. Testing is coming (Note to self: must stop watching Game of Thrones). I've heard it across the district, kids don't know their facts. They are in fourth and fifth grade and are still using their fingers. Obviously, the answer to this major speed bump (cough cough) is practice in the shape of a timed test. What is it about the timed test that will help our students become more fluent? What does fluent even mean? Oh yeah, the California math framework spells it out for us. What jumps out at you? There's a lot that jumps out at me. "culminations of progressions of learning, often spanning several grades... conceptual understanding, thoughtful practice, support, reasonably fast and accurate, does not slow down or derail the problem solver... Procedural fluency requires skill in carrying out procedures flexibly, accurately, efficiently, and appropriately. Developing fluency in each grade may involve a mixture of knowing some answers, knowing some answers from patterns, and knowing some answers through the use of strategies." So if the standards are telling us that in order to be fluent, kids need to be flexible, accurate, efficient, and appropriate, what the heck does that even mean for our instruction? Not to mention, how does running copies from mathdrills.com help us achieve that goal? How do we teach kids to be fluent? What are the best practices??? A great question from my good friend Katie: If we don't use timed tests, how do we monitor our students' fluency? Which lead me to my next question... What are we really monitoring with timed tests anyway? How is using assessments such as these helping us toward our goal of knowing some answers, using patterns, and using strategies? In my own humble opinion here, I think what is happening is that teachers don't want to let go of one thing until we have another to hold onto. A question I have for myself is, how do we help teachers develop enough confidence in better instructional practices that they would be willing to let go of not the old, but really in this case, the harmful? I have some thoughts... but I am more interested in yours. So where do we go? What do we do? 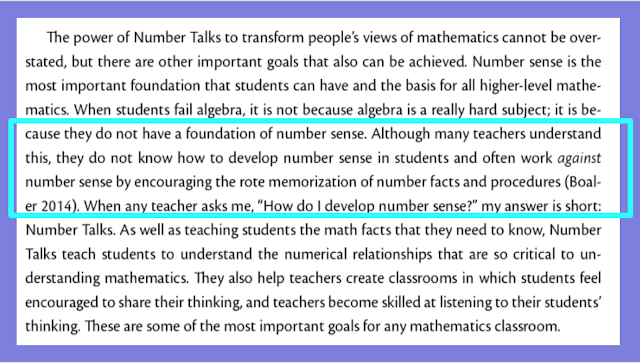 One of the best answers I know of is Number Talks. We as teachers, cannot afford to say that we don't have time for Number Talks, I don't care what grade you teach. In my head, I figure you either pay for it in the beginning or the end. Isn't it usually cheaper in the beginning? 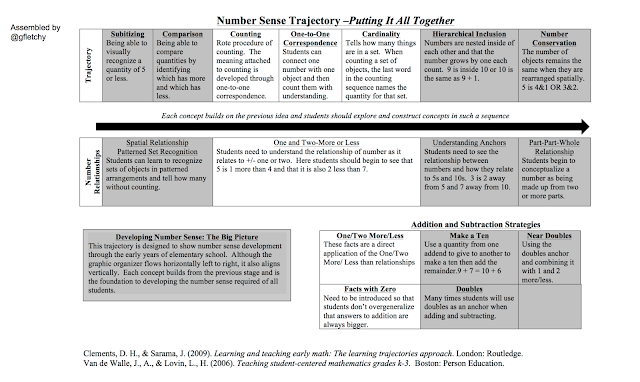 The last month or so my coworker/friend Stephanie & I have been working on some professional development for teachers surrounding fluency and specifically Number Talks. Teachers had some introductory training on Number Talks a year or two ago and they have tried it out, some more than others. Over time some took off and did great things, while others kind of fizzled out or didn't grow into what they could have. So, why is that? In my own opinion... The first reason pains me to say it, but it's the same problem we have with an over reliance on publisher's curriculum. We don't trust ourselves, so we trust the curriculum that's given to us. "The people that wrote it must know more than we do, otherwise they wouldn't be writing curriculum?!" (topic for another day) Another is that it takes time to thoughtfully plan Number Talks and we are already overwhelmed. To start off we modeled a number talk with the teachers and we showed one from a first grade class as well. Then, we began by working on a progression of fluency. I teach first grade, and let me tell you there is a lot going on in kindergarten that kids have to have before they can even think at working on addition and subtraction strategies to build fluency. In our training we used this progression that Graham Fletcher shared. The framework and progressions documents go through the same big ideas, but they don't have a nice chart - all in one place. Teachers had sheets of paper with the name of each big idea and they were asked to draw a picture of what it looked like when a kid was doing that. Then, we asked them to put them in order on a long sheet of butcher paper. We went through them and talked about the controversy at the beginning (perceptual subtilizing) (thank you to my #MTBOS crew, especially Mark Chubb who helped me with that ahead of time), we talked about why one thing went to another. We also put up Stephanie's butcher paper from the 3rd-5th grade fluency progressions - Number Talks training to see how one grade span built up to the next. It's one long skills/understandings progression. After building the progression we asked teachers to work together and identify where they thought the bulk of the class was at in the progression, and then to plan out about five Number Talks that would help build that understanding. Teachers did a lot of sharing about what was going on in their classrooms. Toward the end we shared resources for number talks like Sherry Parrish's books - there is a list of strategies at the front so teachers could turn to that if they need help identifying what type of Number Talk would help elicit a certain strategy. We also shared the link to Ryan Dent's site that has a ton of slides for Number Talks. Finally, we offered to plan, demonstrate, or to help with whatever teachers needed to successfully implement Number Talks in their classrooms. Obviously, Number Talks is not the only way to build fluency, but can you really name one other single practice that tackles flexibility, accuracy, efficiency, and appropriateness? All in one shot? Another one of my personal favorites for building fluency are estimation tasks like Estimation 180 from the infamous Andrew Stadel, (Ryan Dent has a K-2 version of 40+ slides.) Want to make kids slow down and make sense of problems while focusing on reasonableness? This is for you! Um, yes. What if we just did it differently? 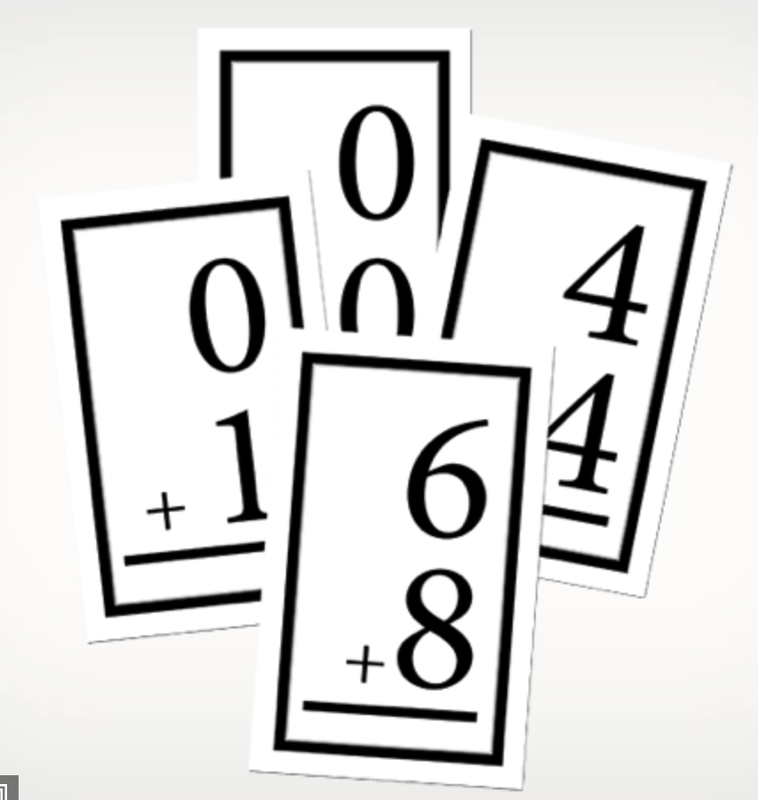 What if instead of printing out pages from mathdrills.com you used thoughtfully selected problems that could show mastery of certain strategies? What if you monitored things like: counting on, uses make 10 strategy, doubles, near doubles, compensation, properties of operations, etc... instead of just "fluent." Think about how much more it tells parents if we explicitly share what we are looking for in a student that is truly fluent. Without that information, what is a parent likely to do to help their child become more fluent? Yep. Obviously, they are going to do what they know. Why wouldn't they? That's all any of us can do. "When you know better, you do better." Love your thoughts. Agree on powerful number talks and keeping them going daily. Spending time reasoning and discussing math is not always a priority in the classroom because we’re so focused on drilling and getting the right answer. Yet, if we take the time to explore and talk about how we’re thinking about math, students can truly begin to grasp these concepts. What I love about the example number talks you linked to are all of the great visuals and real world related problems that are clearly going to be exciting for students. I find there’s nothing quite as motivating for children to work on something as peaked interest and excitement. I have to say one of my favorite ways to work on fluency is through the use of manipulatives. For ideas like “make a ten”, manipulatives are the perfect way to see this concept in action. They can actually see the equal quantity, whether it's 7+3 or 6+4. Allowing for children to use manipulatives especially in the early elementary years isn’t a crutch to me, rather it’s allowing them to make important discoveries and connections about math. I think it’s unfortunate that we’re encouraged to push towards memorization so quickly. While I think it’s important to memorize number facts, I’m not sure we should be in such a rush. Number talks in combination with manipulatives are powerful teacher tools for achieving fluency. Not only do students physically lay out and solve the problem, they discuss what they’re doing and why they’re doing it. Thanks for the great post discussing all that’s REALLY going on in math! I agree 100% with you and, as Math Coach, have successfully gotten rid of those dreadful timed tests. Have you heard of Dr. Nicki Newton's book Math Running Records? I've been leading an initiative to give these three times a year to assess the progress of our students in their math fact speed (not that the kids know that), accuracy, AND their flexibility of thought in using strategies. 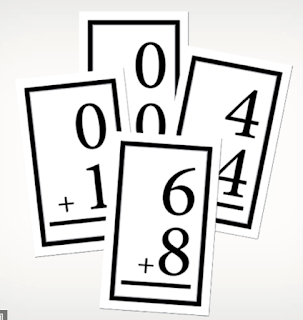 We make note of whether students are counting all, counting on, using derived facts, etc. It helps us zoom in on where the student is in that progression as well as what exact strategy the students need to work on. It has transformed everything for us. We allot a 30 minute time once a week for students to be taught the strategies using manipulatives and then work on the strategies as determined by the running records incorporated in games. It's been wonderful! I've created a set of videos that discusses the progression of addition stragegies we are using and which math tools can be used to teach them. Enjoy!